Gymnastics Nova Scotia is currently working very closely with Gymnastics Canada and the other Canadians provinces in the area of Safe Sport. Gymnastics Nova Scotia acknowledges, understands and embraces our responsibility to take a leadership role in creating and preserving gymnastics environments that ensure positive, healthy, and fulfilling learning and training experiences for all of our participants. We are continuing to work together to implement a safe sport framework for gymnastics across the country including policy, education and advocacy initiatives. This framework is designed to help members identify potentially unsafe situations and to take proactive steps to ensure the safety and well-being of athletes. This includes providing safe channels for athletes to communicate concerns with respect to their safety and well-being without risk of reprisals, and enhancing enforcement mechanisms for addressing individuals who breach safe sport policies. 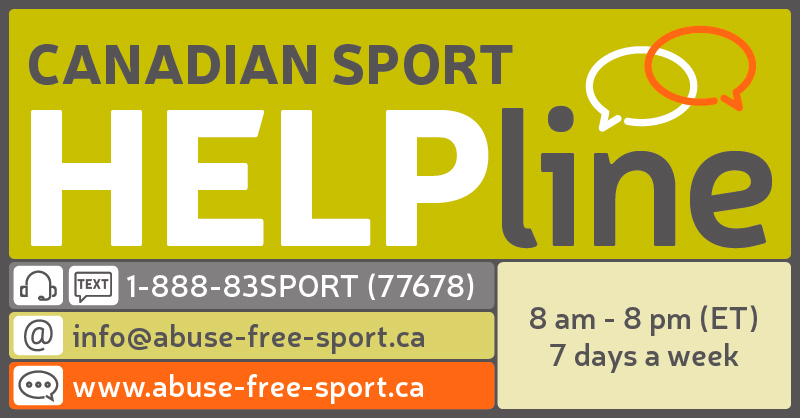 The Sport Dispute Resolution Centre of Canada recently released the Abuse Free Sport helpline. You can read more about by clicking the link below.